PJS & PHILJEC organized a welcome dinner reception in honor of new Japanese Ambassador to the Philippines, H.E. Mr. Koji Haneda and spouse on December 18, 2017 at the New World Hotel, Makati City. The event also served as the Christmas party for members and officers of both organizations. PJS President Mr. Francis M. Laurel welcomed Ambassador Haneda and guests with his opening greetings and toast while PHILJEC Corporate Secretary, Mr. JJ Soriano took on the role as emcee for the evening. 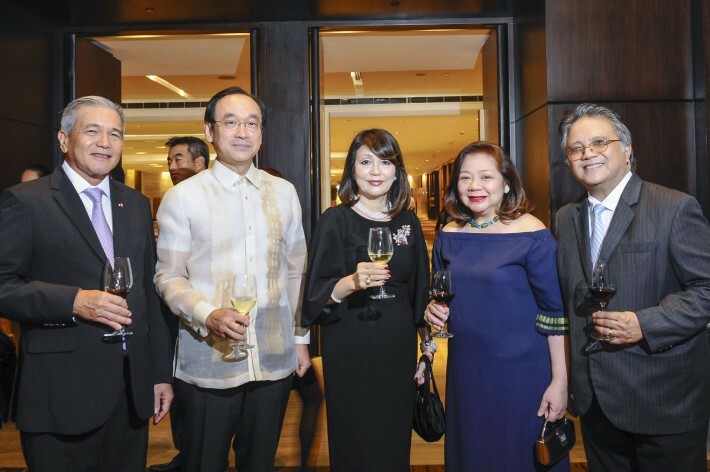 More than 70 distinguished guests attended the dinner including former Philippine Prime Minister and Grand Cordon of the Order of the Rising Sun awardee Mr. Cesar Virata and former Amb. Benjamin F. Sanvictores, Executive Trustee of The Philippines-Japan Friendship Foundation (PJFF). Ambassador Haneda arrived in Manila on October 14, 2017. He started his diplomatic career in Manila in the early 1980s and thus referred to himself as a “Balikbayan” and expressed his delight for being in the Philippines again. “It is my honor and privilege to be assigned as Ambassador of Japan to the Philippines. Indeed, I started my diplomatic career in Manila in the early 1980’s. Being a Balikbayan, I’m delighted to be here once again. Under the strategic partnership, our bilateral relations have evolved to a significant level, as represented by the state visit of Their Majesties the Emperor and Empress in January 2016 and other frequent mutual visits of our leaders. Through the years, our partnership has achieved tangible outcomes in many areas, including infrastructure projects on an unprecedented scale, capacity building in counter-terrorism and maritime security, defense cooperation, and continued commitment of support to the Mindanao peace process. I am also pleased to see ever-growing people-to-people exchange between the Philippines and Japan in every field and level.